If you often find yourself in dire need of a quick nap while on campus, you’re likely in favour of getting a few sleep pods at KPU. 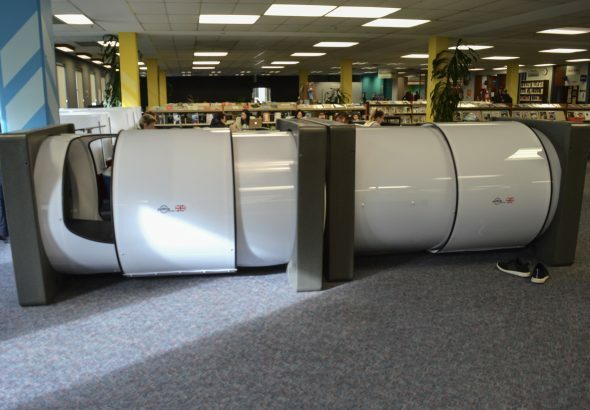 BCIT installed two sleep pods in their Burnaby campus library as a part of a pilot project in July of 2016. The technical institute noticed that students were curling up to sleep in various areas of the library anyway, so they planted the sleep pods there as a way to support the well-being of their student body. Sleepy students can book a 30 to 60-minute “power nap” inside of the cylindrical pods, which are designed to fit just one person. This is to prevent student-on-student hanky-panky, a problem that supposedly led UBC to close their nap rooms in the ’60s. The BCIT pods are under video surveillance, and staff working the service counter are only a few metres away from them, so they’re perfectly safe. They’re also intentionally not soundproofed, and you can keep your belongings with you while you’re inside. Alison Griffin, the BCIT Librarian and Collections Coordinator, says that the reception to the sleep pods has been excellent. “[The pods] made national news, so it turned out to be a great marketing investment,” she says. It’s well known that sleep is essential for student learning and memory retention. According to The National Sleep Foundation, a 40-minute nap can improve a person’s performance by 34 per cent and boost their alertness by 100 per cent. It’s also safer for students to take a 20 minute nap before driving home than it is for them to operate a car while feeling groggy from sleep deprivation. Considering how many three-hour courses our university offers, my guess is that many student would be in favour of sleep pods at KPU. Sleep is often overlooked when students are trying to juggle a heavy course load or study for three to four exams at a time. The pods would be quite a convenience, as people would be able to catch up on their sleep without worrying about their safety. Sadly, they just might not be a worthwhile expense for the university. According to CTV News, BCIT’s models are priced at $2,000 apiece and are funded by vending machine sales. At KPU, there are other issues that still urgently need improvement, so spending a few grand on a handful of sleep pods right now seems unwise. Jessica Wiechers, a first-year general studies student at KPU, thinks that the sleep pods are a great idea, but would rather see the university spend money on healthier food options in the cafeteria. Surely, in that regard, she’s not alone. If sleep pods can help boost student energy on campus, having KPU test them out in the future may be worthwhile. In the meantime, there are other, more important developments that students could benefit from.